English pianist Clive Swansbourne has been internationally acclaimed for his performances in both America and Europe. Now living and teaching in Houston, Texas, he continues to perform his large and wide-ranging repertoire regularly and to record on the Swan Records label. He produces illustrated talks on many of his recordings in his Enlightened Listener series. 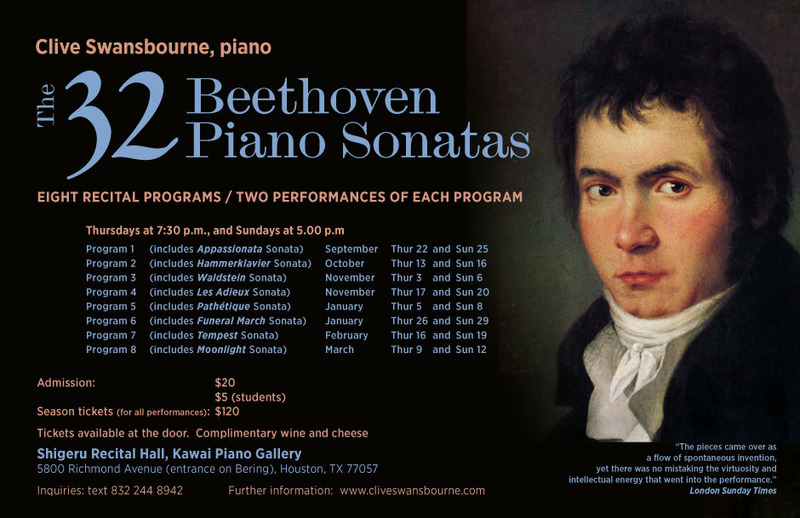 "Swansbourne's playing was like a pool in a forest, of great mystery and beauty"
I’m gearing up for my fifth journey through the thirty-two Beethoven piano sonatas, starting on September 22, 2016 (see Recital Series, right). The last one was eleven years ago when I performed them at Houston’s Rothko Chapel. This time the venue is the new Shigeru Recital Hall at Houston’s Kawai Gallery. The acoustics are superb, and the Shigeru concert grand is one of the most beautiful pianos in Houston. I am greatly looking forward to playing often on that magnificent instrument. A journey through the thirty-two Beethoven piano sonatas, taking full advantage of the state-of-the-art acoustics at the new Shigeru Recital Hall in the Kawai Gallery, 5800 Richmond Avenue. 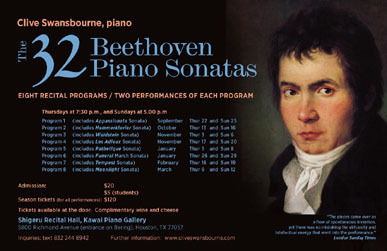 Eight recital programs - two performances of each program. Running between September, 2016 and March, 2017. In this work of astonishingly wide-ranging musical style and allusion, Beethoven adopted a highly distinctive approach to writing variations, taking an original work by minor Viennese composer Anton Diabelli and developing it into 33 variations filled with sophistication of harmony, invention and brio. To read more details about the contents of this recording, to listen to selected extracts, or to find out how to buy it from this web site, please click the link below.